Since Swim Guide’s earliest days, Miami Waterkeeper has been one of our greatest supporters and champions. Multi-faceted and community-oriented, Miami Waterkeeper is a leading voice for Miami’s Biscayne Bay. Now, after years of advocacy, research, and outreach, Miami Waterkeeper has launched their own recreational water monitoring program. We couldn’t be more excited to officially welcome them to the Swim Guide Affiliates Program. Lead by Executive Director, Waterkeeper, and rockstar marine biologist Rachel Silverstein, Miami Waterkeeper’s “mission is to defend, protect, and preserve South Florida’s watershed through citizen engagement and community action rooted in sound science and research.” In doing this, they aim to ensure our shared vision of a swimmable, drinkable, fishable future for all. Rooted in their community, Miami Waterkeeper’s work focuses on three core issues: clean water, ecosystem protection, and sea level rise resiliency. Their clean water initiatives include working to prevent industrial pollution and mitigating harmful algal blooms. Their ecosystem protection initiatives focus on protecting coral reefs, mangroves, and seagrasses, all of which are vital to a healthy ecosystem. Finally, through their resiliency work, MWK aims to educate and advocate for a sustainable future in a city that is especially susceptible to the impacts of climate change. Across these core issues, MWK also organizes several campaigns designed to increase awareness and affect tangible change. These include reef protection, ending sewage dumping and beach closures, and holding industrial polluters to account. With their new recreational water monitoring program, MWK will monitor and report on 7 sites around Biscayne Bay. In addition, they also assist Swim Guide by entering Florida Department of Health water quality data for Miami-Dade and Broward counties. Essential to the cultural and economic fabric of Miami, Biscayne Bay is a shallow, tropical lagoon that reaches 35 miles long and 8 miles wide. Roughly divided into North, Central, and South regions, each area has its own unique uses and issues. Accounting for roughly 10% of the bays water, the North Bay is heavily developed, and prone to sewage spills and urban runoff. The Central Bay is the largest region, and is where the Bay mixes the most with the Atlantic Ocean. The South Bay is nearly the same size as Central, and is the least affected by development. The Central and South Bay area is largely taken up by Biscayne National Park, one of two National Parks that surround the city of Miami, along with Everglades National Park, which also has significant physical, chemical and biological connections with the Bay. At the heart of Miami, Biscayne is not only a critical, biodiverse habitat, but an economic and recreational hub for the city. 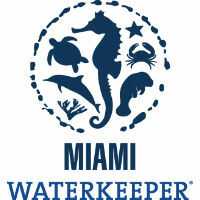 Through their work Miami Waterkeeper strives to make sure it will stay this way for generations to come.